In writing Facing East, one of the main characters, Robert Davis, heads to Italy for six months hoping to find his Shangri-la. It allowed me to draw from my own experience while on a garden tour in Tuscany. I could not resist the charms of Italy, and neither can Robert. Robert talked about the people in the Piazza Navona, where he now walked between the street performers and the artists drawing caricatures. Here was a man who was unchurched, with no visible piety as far as Katherine could tell, drawn to the churches where he sat tucked in a corner observing the tourists walking quietly up and down the aisles, some stopping to pray before side altars. He watched the Italian people with their small children arrive for a mass he knew very little about, though he was beginning to comprehend the words that were spoken. 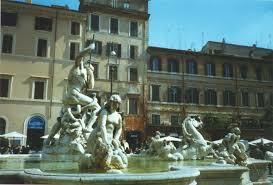 One of the places in the novel you will enjoy is the Monti section of Rome. It has now become a ‘happening’ area which is beyond the timing of the novel, but I can only hope that the increased interest in the area has not ruined what Robert loved about it. Some of my favorite scenes in the book take place in Monti and the winding narrow streets that take you to several restaurants mentioned. I know you will agree with me that it is a place hard to resist. 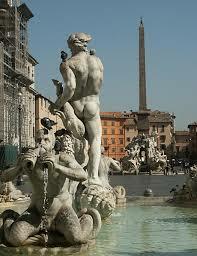 This entry was posted in Facing East - A Novel and tagged Piazza Navona, Rome. Bookmark the permalink. I’m enjoying this, Stepheny. Gene and I are looking at a 17 days Smithsonian trip for next fall – sort of a ‘if this is Tuesday, it must be Belgium’ trip, which takes in Naples, Pompeii, Rome, Orvieto, Perugia, Florence, and Venice. This will give us a taste of the country and then we can decide where we want to return on our own for a full meal!